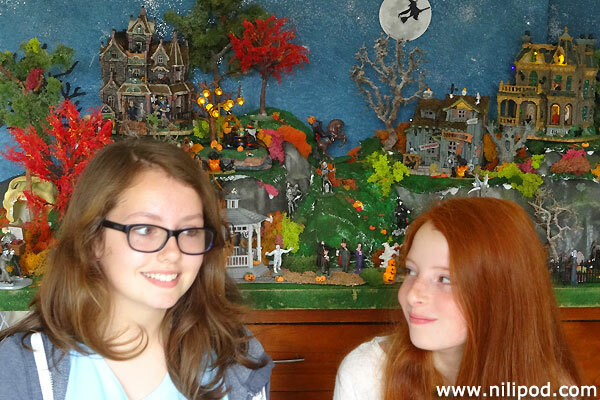 Each year, Nia's family go crazy at Halloween, and again at Christmas, with their awesome model villages. These tend to feature all kinds of tiny houses and figurines (made by Lemax), with this particular Spooky Town coming with haunted houses, dancing witches and a moving Grim Reaper statue - creepy. There is also a tiny cemetery with gravestones, a skull (this was actually an old fish tank ornament) and lots of model railway trees, many of which we made using old branches and red 'reindeer moss' to create the appearance of seasonal autumn foliage. The village looks particularly good at night-time, because all of the houses light up and flash, simulating a stormy night with lightning in the sky. If you look closely in the background, you can even see a witch flying past the full moon, and beneath it, the headless horseman is coming down the hillside.